I don't even know if it is a he or she! I am sure someone out there can identify it for me. Happy weekend! You do not have to know it. Hi Icy Good shots however I o not know the ID for you. Have a wonderful weekend. Great shots of your bird. I am not sure it looks like a female or juvenile blackbird. Thank you for linking up to my critter party, have a happy weekend! looks like a juvenile to me. 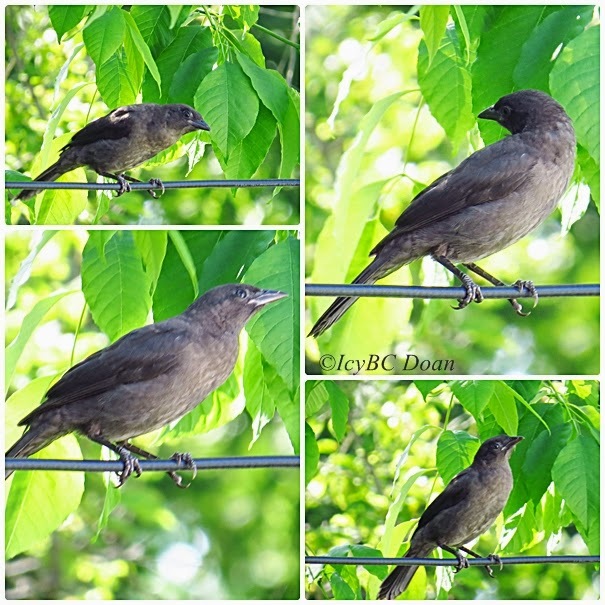 maybe a cowbird? hope eileen can help - she's the bird expert! A very pretty bird whatever it is. I don't know the species, but it is a beautiful bird. It looks nice against the beautiful green leaves. hope it wasn't ill. great images.